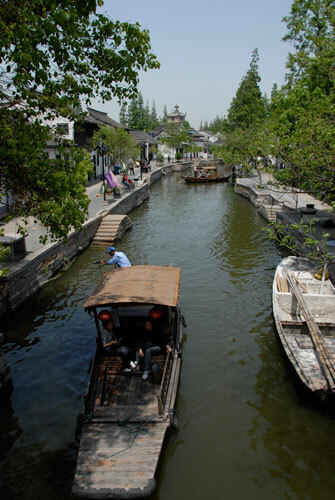 Nestled 30 miles away from the busy Shanghai metropolis, lies the “water village” of Zhujiajiao, a designated World Heritage site whose close proximity to a network of willow-shaded canals evokes comparisons to Italy’s Venice. 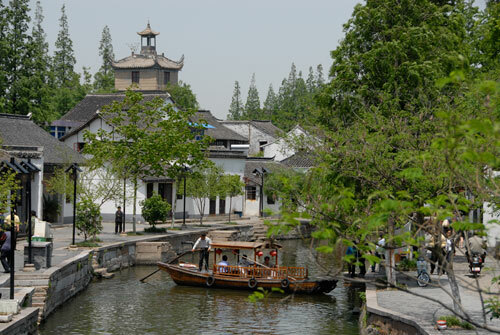 Though the town originated 1,700 years ago as a commercial hub and fishing village during the Song (960-1279 C.E.) 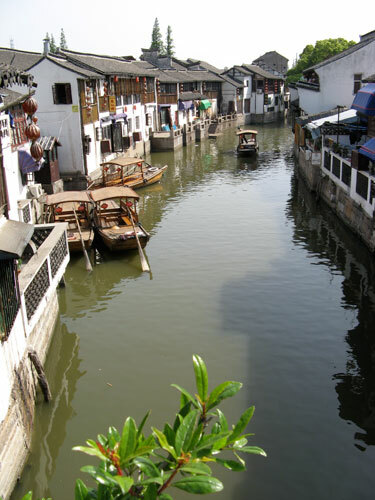 and Yuan (1271-1368 C.E.) dynasties, archeological records indicate human settlement ranging back as far as 5,000 years. 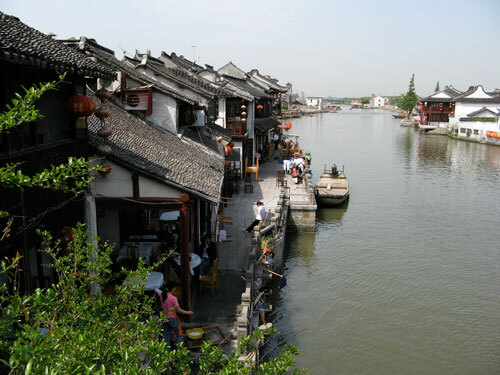 As the sprawl of Shanghai expanded, the city absorbed Zhujiajiao and similar villages as suburbs. 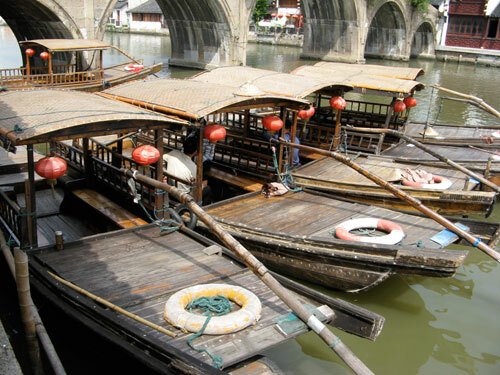 Zhujiajiao is renowned for its historic architecture, especially wooden, stone, and marble bridges built during the Ming and Qing Dynasties. 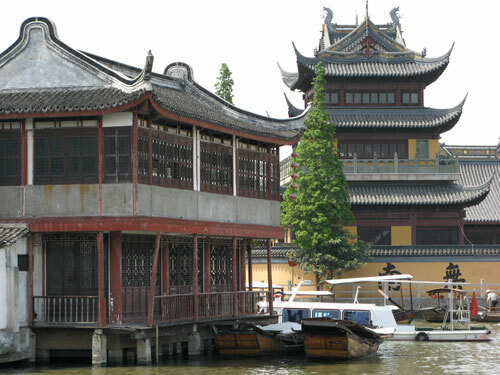 Particularly impressive are the Lang and Fengshang Bridges. 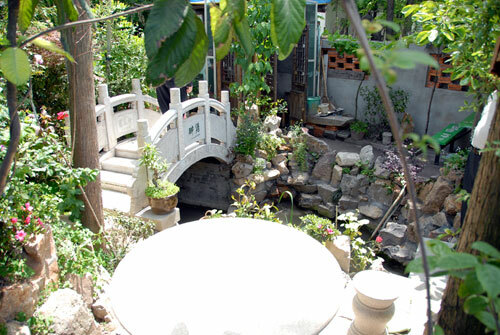 The Lang (or “veranda”) is the village’s sole remaining wooden bridge. In Mandarin, “Fangsheng” roughly translates to “live forever,” and the name represents the customary release of fish back to the sea. English-speakers call it the “Rainbow Bridge” because of its arched shape. 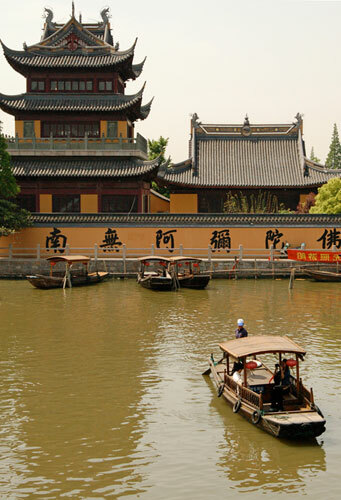 The Fangsheng Bridge is the largest of Zhujiajiao’s 36 stone bridges and sports the Dragon Gate Stone tablet, which is engraved with dragons surrounding a pearl. 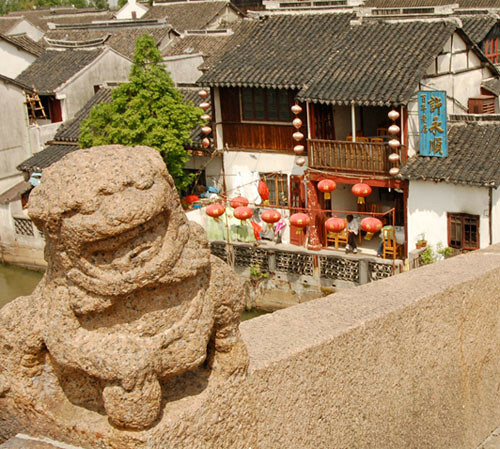 According to legend, a dragon once lived under the bridge and acted as a king of the sea to protect the village. 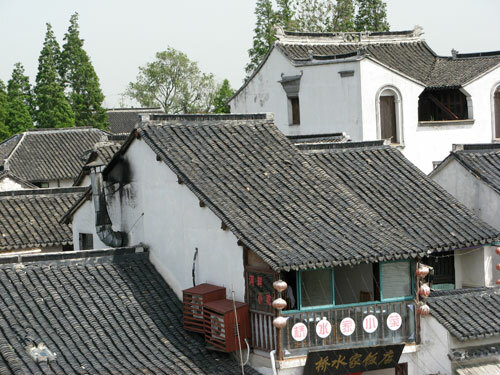 Picturesque Ming and Qing-era building ”with slate roofs, courtyards, whitewashed doors and pointed eaves” lining the cobblestone paving of North Street have made it a favored tourist destination within Zhujiajiao. 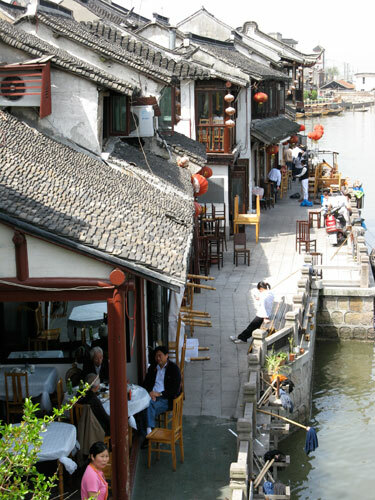 Along the river, people conduct small calligraphy, Chinese-painting, and souvenir-selling businesses in front of their homes. 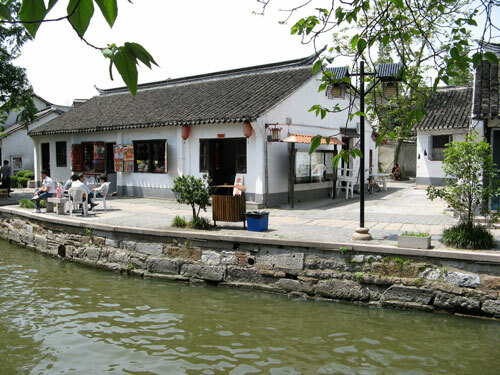 Restaurants and street foods are available at different sections of the town. 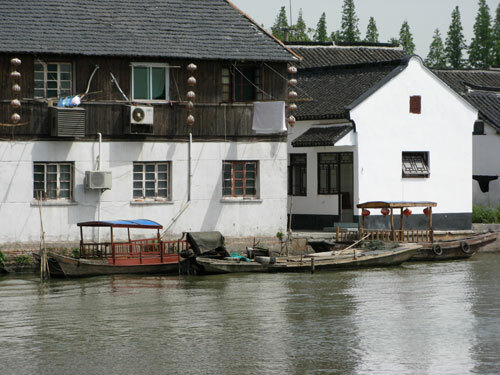 A museum built by a carpenter 200 years ago showcases the history, residential life, and culture associated with the village. Display rooms exhibit the ancient Chinese furniture and their corresponding patterns within a traditional Chinese family. For example, seats on the left- hand side of the living room represent the higher authorities. They are usually occupied by the host. The sitting room is designed for women since they were not allowed to greet the guest in the living room. 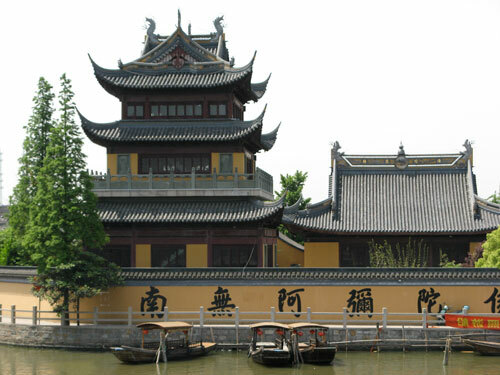 The museum also displays the Chinese kitchen with an old-style stove that has a small alcove ”the house of the kitchen god and the god’s representative statue. Fruit was offered to the god at the New Year. 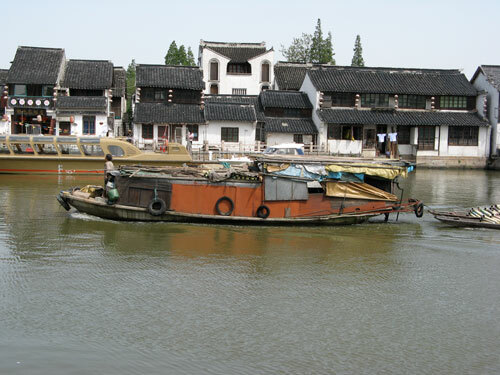 As Zhujiajiao developed as a tourist spot, some of the residents became tourist boat drivers. An upscale housing development that uses the historic water village for branding purposes arose adjacent to the village. 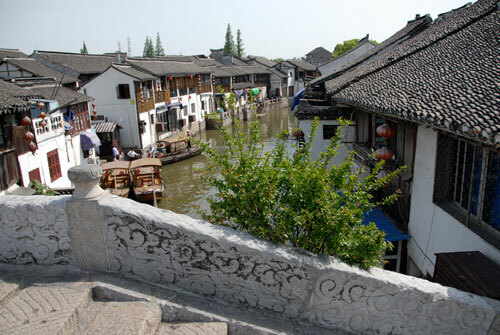 The water village can accommodate 25,000 to 30,000 visitors. 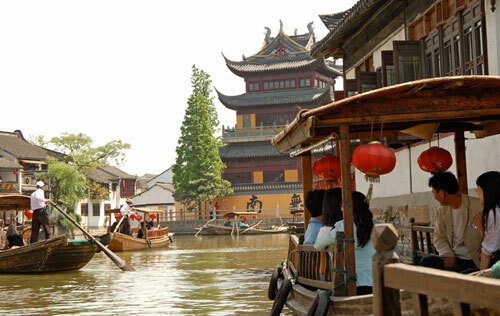 During the Chinese Labor Day, there may be as many as 10,000 to 15,000 local visitors. 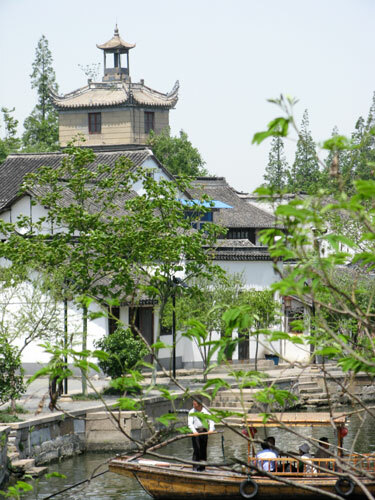 About 100 to 200 foreigners come to visit this water village every day. 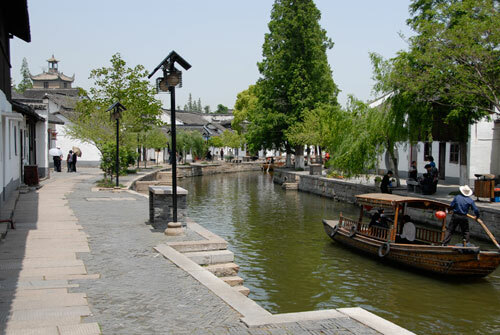 Associated with the development of historic Zhujiajiao and the new housing area, a staff manages tourism opportunities. 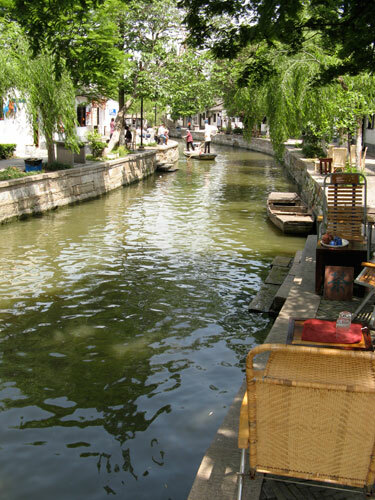 To further promote Zhujiajiao tourism, the management is developing new resorts and parks surrounding the water village. 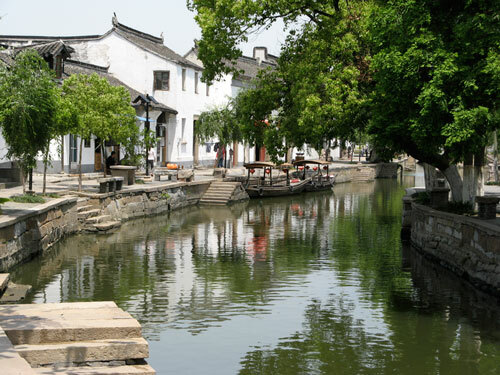 Earned revenue from the new facilities will be used for the preservation of the Zhujiajiao old town.